When a working agreements is written, agreed on and posted visibly in the workplace, every team member has the opportunity (and obligation) to enforce it. The beauty is that this can be done in an easy and non-judgmental way. For example, if we say in our working agreement that everyone is to update the time tracking system by Friday at 3:00 and a team member doesn’t do it – anyone on the team can point out the deficiency. We don’t have to wait for management to notice and take action. A peer could easily say “Hey, remember our Working Agreement? Can you make sure you update the system?” Peer feedback is often much more motivating than management feedback anyway, and it is always more timely. It’s easy to throw a bunch of folks in a room and call them a team. But what really creates bonds and mutual respect? The working agreement can be part of that transformation. The simple act of getting everyone together to draft the working agreement is a great first step. Encourage everyone to speak and allow people to challenge items that won’t work for everyone. For example, one of my co-workers wanted to add to our working agreement that you shouldn’t interrupt someone if they were eating lunch at their desk. For him, it was just a few minutes of down-time and he wanted to eat in peace, which is a fair request. However, that wouldn’t work for me. As someone who is in meetings most of the day, if I am at my desk, I am usually sought after for information or advice. I don’t mind if you stop by when I am eating as long as you don’t mind if I chew while we talk (but I would never speak with my mouth full!) Therefore, we added the item to the working agreement but only for the originator of the request. If nothing else, it prompted a great conversation and made us feel like more of a team. The easiest way to introduce a working agreement at the office is before a long meeting. The meeting could be a few hours or a few days, but long durations tend to bring out the worst in all of us. Ask for five minutes at the start of the meeting, and of course, make sure you have the meeting host’s approval. Ask everyone to define the appropriate behaviors for the meeting. Do more listening than talking. You may have to prompt the group with provocative questions like “Are smartphones allowed? Who is taking meeting minutes? When are break times? If everyone is not back after a break, does the meeting commence, or do we wait?” With a little prompting, a healthy discussion should take place. If there is time, it is good to revisit the working agreement at the end of the meeting and get feedback. What did people like about it? What do they want to change? 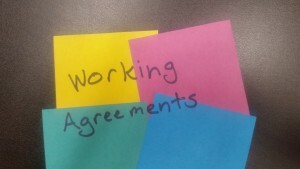 I hope you find working agreements to be a useful tool on your Agile journey. 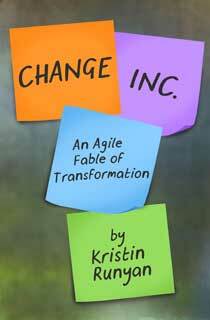 And if you would like to learn more about using Agile tools in all aspects of your life, please read my book Change, Inc.: An Agile Fable of Transformation available on Amazon.com.